IF THE REPUBLICANS THINK THEY CAN EVEN CONSIDER MASS CUTS IN SOCIAL PROGRAMS AND STAY IN POWER, IJSMDH? The duration of our USA welfare state is fast coming to an end, and in my view only the Republican Party will possibly save the USA from a bankrupted full socialist state with authoritarian rule. As for the Dem's with their extreme shallow minded know-it-all liberal news media side-kicks riding shot gun they are lost somewhere out in fantasy land. And it is a lost cause to expect them to save the USA in terms of exercising financial responsibility. The only way to prevent the USA from becoming a full socialist state and resorting to full authoritarian rule is to make a drastic structural change to the whole U.S. economic system. Messing around with cutting social programs will only get the republicans booted out of power, and then the Dem's will have clear sailing right into a full socialist state. Once the Dem's and liberals get their socialist state and the mass civil disorder that follows, authoritarian rule will be inevitable. This economy thing they call economic growth is a two headed snake in my view, it is maybe two parts inflation and maybe one part growth, what is correct, no one knows, I call the whole thing "Inbreeding". A true free market place economy must be pure, which means very little government money should be injected into the private U.S. economy. Injecting mass amounts of government money into the private U.S. economy is like inbreeding in my view and is what causes inflationary phony growth. Inbreeding contaminates the whole free market place economic process by destroying societal discipline throughout the whole society, which leads to the destruction of the nuclear family system. Without a strong nuclear and extended family system almost no one teaches proper norms and tradition to the very young, then after four or five generations individual freedom is impossible. That is where the USA is at today, and the saddest part of all is so few has the wisdom and survival instinct to see past their nose to recognize a moral or physical threat staring them in the face. The only thing that is going to save the USA is to separate the private U.S. economy from being deluged by the injection of mass tons of government money. By stopping that deluged it will solve the U.S. health care problem, the U.S. immigration problem, the lack of jobs problem, and all other dire problems wrecking havoc on our beloved country, a genuine true free market place economy never fails. 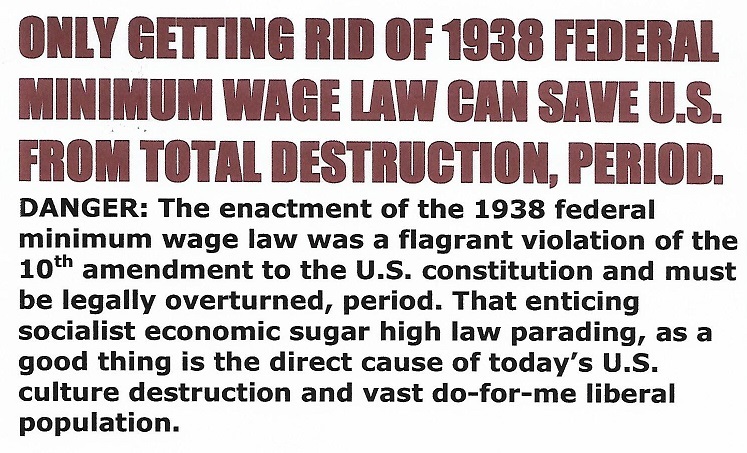 As to the solution to save our free nation: "There is more than one way to skin a cat", In my view the arch-evil 1938 socialist minimum wage law has the USA economy in a full nelson in terms of our economy being a free market economy. One way to set the USA economy free and save our freedom is starve the welfare state beast by simply repealing the 1938 minimum wage law. Another way is to prevent government money on an individual basis from being injected into the private USA economy and contaminating it to no end. Almost everyone agree that the federal government has a responsibility to help the poor and needy, but the problem is when government money is given out on an individual basis that competes directly against the poor hard working citizens thereby driving consumer prices beyond their reach. The only way to protect the working poor and middle class in the private U.S. economy and government still help the poor and needy is for government to provide its own hospitals, commissaries, and housing units. And above all tokens or script must be used for all who qualify, that way the working poor and middle class in the private sector will be protected and be able to pay their own food and hospital bills out of pocket like before the welfare state came about with the "New Deal". There is no need for the government to get directly into the nut and bolts of daily operations, the whole process can be contracted out, because the whole focus is to protect the working poor and middle class in the private economy from living from pay check to pay check like it is now. Folks, that is the way I see it, I'm just one man with some strong political views, I realize very few will agree with me on anything. My only goal is in my own way help save my beloved country for my grand kids and on down the line. I know many of my views may seem hard and cold and even to the extreme. Maybe some people need waking up. And I must say that I am deeply thankful that I can still freely write what I think and feel without disappearing in the middle of the night. God, save my beloved USA. And God, I thank you in advance for saving my beloved country. Amen. You can't have a strong nuclear and extended family system and a well-established welfare state at the same time. If the USA had a strong nuclear and extended family system it could survive a total economic collapse and quickly regroup and rebuild. But, as it is now if the USA economy totally collapsed with millions upon millions solely dependent on government, less than half of our 321 million population might not survive a total economic collapse. Unless the USA welfare state is abandoned soon a total economic collapse is imminent in this writer's view. Sure, not only the shallow minded liberals can't conceive of this being possible, but due to the conditioning of our welfare state 90 percent of the whole country can't either. World economy help would only buy little time. In fact the U.S. economy is still the main engine driving the world economy, so if the U.S. economy goes down the world economy goes down with it also in my view. I pray that my wild imagination is just that, phew.